Despite her tragic circumstances, Jadwiga led a life of virtue and loyalty both to God and Poland. Her heart-touching story is more unbelievable than fiction. Trumpets blared and a royal congregation gathered at Krakow’s Wawel Cathedral on October 15, 1384. It was coronation day for a new king. There had been much feuding and even bloodshed among the Polish nobles to determine who would succeed King Louis of Anjou, a ruler more interested in his native Hungary’s future than the Kingdom of Poland’s. After the scuffling, a decision was rendered and, miraculously, historical sources indicate that not one voice of dissent rang out against the newly-chosen ruler at the coronation. But there was something even more special and different about this king. She was an eleven-year-old girl. Jadwiga was born in 1373 in Hungary, the daughter of King Louis of Anjou, who was the grandson of the Polish king Władysław Łokietek. At that time, royal houses intermarried, so even though Jadwiga was born to a Hungarian king, her roots were Polish. After the Polish king, Casimir the Great, died without an heir in 1370, the Polish nobles chose Jadwiga’s father, Louis, to rule Poland. The nobles promised King Louis that one of his daughters would succeed him, but there was no agreement on which one. Furthermore, what really mattered to the nobles was which royal house the chosen daughter would marry into and to what degree the king could be turned into their puppet. Thus, different noble factions warred with each other over Louis’ successor. By the time they settled on crowning the child Jadwiga, there had been rampant bloodshed and confusion. The decision was made, though, and Jadwiga was forced to leave Hungary to rule Poland, the first drama in her tumultuous life. She was crowned king instead of queen to solidify her authority. Jadwiga supposedly tried to break through Wawel’s gates with an ax to escape with her prince. During the middle ages, arranged marriages were common, especially among royalty. Kings would promise their daughters to other princes in order to cement diplomatic relationships and military alliances. It was no exception with Jadwiga. From infancy, she had been promised to Wilhelm von Habsburg, Prince of Austria. When she was crowned king of Poland, however, the Polish nobles had other plans. For some time, they had wanted to form an alliance with the Lithuanians against the German Teutonic Knights, who were causing trouble in the north. They approached the Lithuanian ruler, Jogaila, promising him Jadwiga’s hand in marriage if he and his country converted to Christianity and formed a union with Poland. He agreed. Jadwiga was only 14 years old; Jogaila was in his forties. Naturally, when Jadwiga heard the news, she was distraught. The young prince she had originally been promised, Wilhelm, rode to Krakow to whisk her away before she was forcibly married to Jogaila. Accounts claim that he entered Jadwiga’s bedchamber in Wawel castle to rescue her, but the Polish nobles, learning of this, chased him out past the city gates. 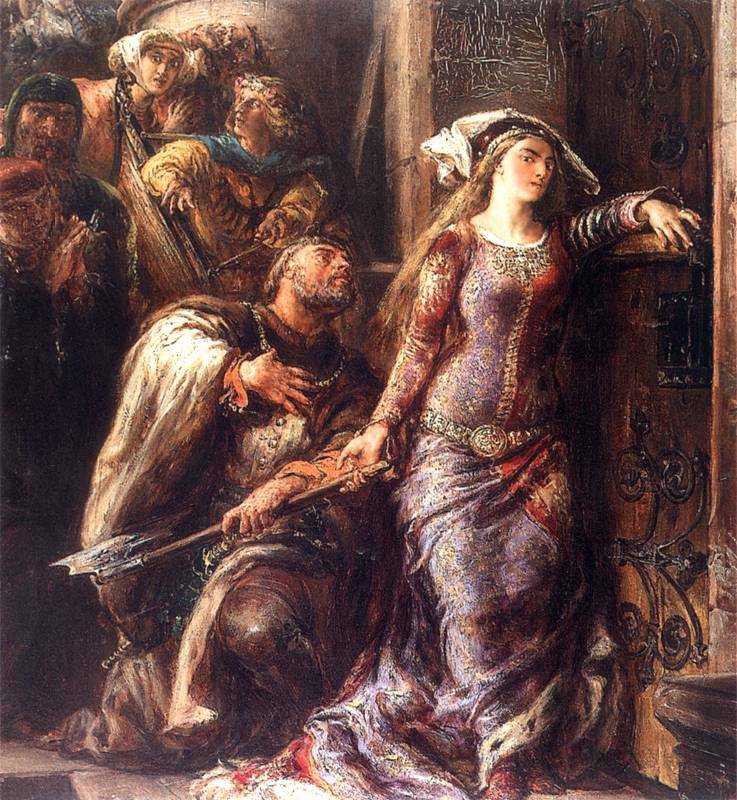 Supposedly, Jadwiga, smitten with love, chased after him and tried to escape through the gates using an ax before being convinced to return to the castle. At that point, she prayed long and hard before submitting herself to what she realized was best for Poland—marriage to the middle-aged Lithuanian ruler. In February 1386, Jadwiga married Jogaila, who became King Władysław Jagiełło of Poland. It’s at this point that Jadwiga became legendary across the land for her holiness and good works. She attended mass daily, praying in front of a large black crucifix in Wawel Cathedral. During one of these prayers, Christ is believed to have spoken to her from the cross. Jadwiga takes her royal oath. Jadwiga is associated with one famous legend that exemplifies her kindness and charity. One day in 1390, she was passing a church under construction. While speaking with one of the workers, she learned that his wife was very sick, but that he could not afford a doctor. Moved by his plight, Jadwiga placed her foot on a stone and removed a piece of decorative gold from her shoe. She gave it to the worker so he could afford to treat his wife. Supposedly, her shoe left an imprint in the stone which the workers removed and placed in the Church of the Visitation of the Blessed Virgin Mary, where it remains to this day. Education was an important cause taken up by Jadwiga during her reign. In 1364, King Casimir the Great had founded Poland’s first university in Krakow, but it had since gone into decline. Jadwiga sought to revivify this institution and add a department of theology. She was successful on both counts. Before she died, she bequeathed her jewelry to the university to assist in its renovation. Her husband, Władysław Jagiełło, continued her work of building up the institution, which eventually became Poland’s famous Jagiellonian University. 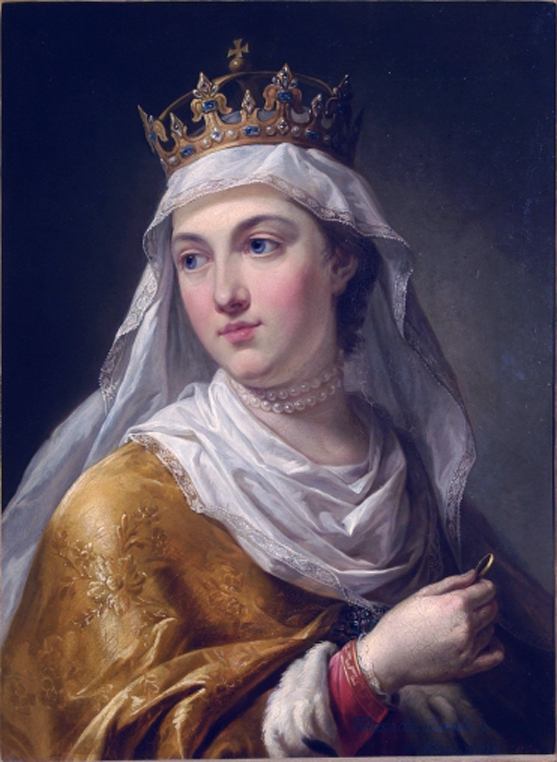 Despite her kind and merciful reign, Jadwiga could not escape tragedy. On June 22, 1399, she at last bore a child, a girl named Elżbieta Bonifacja. The child died 22 days later. Not long after, Jadwiga herself died at the young age of 25, likely as a result of complications from the pregnancy. Poland wept for its saintly ruler, a ruler who had led a life of moral purity and limitless compassion. Jadwiga was buried with her daughter near the main altar of Wawel Cathedral. Jadwiga’s tragic yet fruitful life is unparalleled in Polish history. In a sense, she played the unenviable role of Poland’s sacrificial lamb. 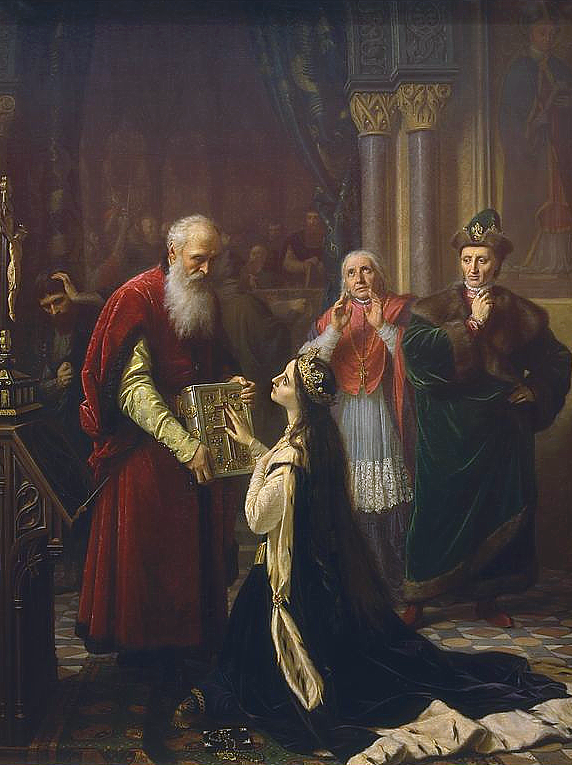 As a result of marrying a man she likely didn’t love, Jadwiga turned Lithuania into a Catholic country, and gave Poland a permanent ally that would eventually help it destroy its mortal threat, the Teutonic Order, at Grunwald in 1410. For this, and her kind reign, she is honored as one of Poland’s greatest rulers. Centuries after her death in 1979, the newly-appointed Pope John Paul II came to pray before her sarcophagus, no doubt a testament to her significance. Eighteen years later, in 1997, he canonized her a saint after the church had researched and proved that she had lived a holy and miraculous life. Her feast day is June eighth. October 16 is the day that I celebrate my saint’s feast day. My saint? St. Hedwig. Are Hedwig and Jadwiga the same person? If they are, why are there two different feast days for her? If not, than who is Hedwig? What is her history? When I was baptized the priest told my parents that I did not have a saint’s name. My father informed him that I was named after the queen of Poland who was a saint. ( I was baptized many, many years ago.). If St. Jadwiga was canonized a saint in 1997 (and she is also St. Hedwig) than the priest was correct in that I was not named after a saint. Or, is St Hedwig a different saint and my father was, indeed, correct and I was named after the queen of Poland?